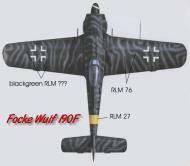 Focke-Wulf Fw 190A5 SG2 G+- flown by oberfeldwebel August Lambert summer of 1943. Remarks:Although a Close Support pilot at all times, destroying 10+ tanks, he was a passionate fighter pilot. 350 combat missions. His first known victory, two Yak-9's on 13 February, 1944. A Yak-9 on 16 March, 1944. Two P-39's on 19 March, 1944. Two Il-2's a P-39 and a Yak-9 on 10 April, 1944. Five Il-2's (all m.H.) on 17 April, 1944. In the spring of 1944, during the Sevastopol Campaign, he was able to boost his victories from 20 to 90, during which he achieved daily scores of 12, 14 and 17 victories. KIA 17 April, 1945, during take-off at Hoyerswerda, Kamenz/Saxony when he was surprised by Mustangs of 55FG, and shot down. Buried at Kamenz-St Just Cemetery. Prior to his death, he was credited with his last victory, a P-51 west of Prague, 17 April, 1945. This P-51 was the last P-51 shot down by an Fw 190. Most victories in the East. Highest scoring Assault Pilot. 17-Apr-45 August Lambert Stab III./SG77 P-51 n.b.